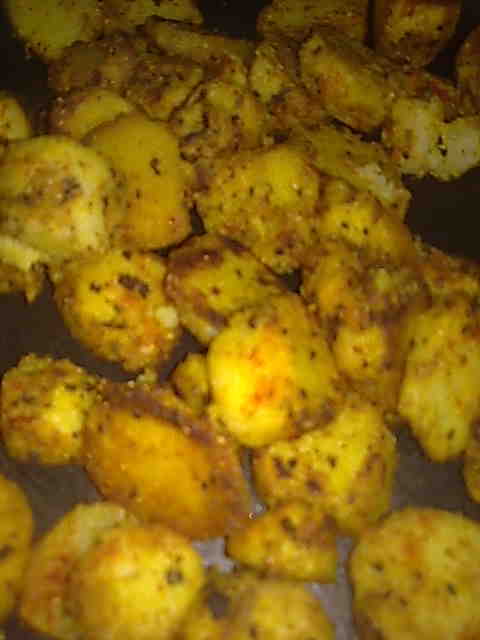 This is a simple recipe of arbi ki sabzi. It’s healthy since arbi is boiled first instead of deep frying as in arbi fry. Deep frying vegetables is an unhealthy practice in my opinion since it destroys the various nutrients of the vegetable as well as adds to the calorie intake. You can also call it arbi masala or spicy arbi. 1. Wash and pressure cook arbi to 1 whistle. Peel and cut into 3/4 inch roundels. 2. Heat oil in a non- stick pan and add ajwain. When they change color, add hing. 3. Add arbi. Add turmeric powder and salt. Mix well and turn the heat to medium- low. Cook uncovered, stirring occasionally till arbi becomes golden brown. 4. Add rest of the spices and cook stirring for 2-3 minutes. Arbi masala is ready to be enjoyed with puri or paratha.